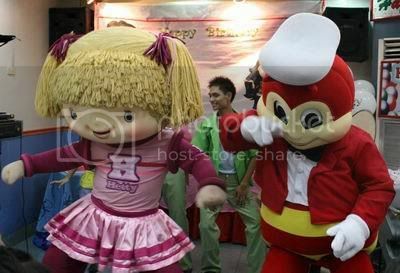 I have been to many Jollibee and McDonalds birthday parties and it's really not everyday that I would rave about them, because they've gotten too generic for me. Which is why something has to be said for the Jollibee branch at Dasmariñas, Cavite where my niece held her first birthday party last Sunday. Her theme was Bratz. I loved that the staff/hosts had an entrance thingie going on, and they had dance numbers. For sure, my cousins paid for the mascots to dance (three dance numbers) but the staff also danced along with them. Plus, they were just really such great hosts. They even had some sort of food parade/entrance going on. Of course, am sure part of the party's success was due to the very participative guests too. But I greatly recommend this venue for those living near the area and are thinking of throwing a Jollibee party. cool!ang cute naman!sana meron ding jollibee rito,haha! musta na mecsy dear?im planning to go home this dec..but im not sure about it...hopefully,makagimik uli along with u guys! !